1. Comes with 120 delicate mini LED bulbs (90 steady LED bulbs & 30 twinkle LED bulbs) for a starry show. 2. Gold steady bulbs are kissed by sunshine while cool white twinkle ones shine like stars in the winter sky. 1. DIY any shape you want as a centerpiece, or drop the string lights inside translucent vases. 2. Wrap it around tabletop Christmas trees, flower bouquets, bonsai, crafts or hang on bedroom window, bookshelf, makeup mirror, etc. 1. No wiring required, comes with a compact battery box (3 AA batteries included), not really noticeable and easy to decorate. 2. Light up automatically with a 6/18 timer at night. 3. Ideal for Christmas, wedding, party, festival, etc. 1. Long lasting LED bulbs stay cool to touch after long-time use. 2. Provide energy saving while enhancing your home atmosphere. 1. Press button once will turn on at the same time every day for 6 hours then light up again after 18 hours automatically; Press twice will turn on constantly. 2. When turn on the light, please firmly press the center of the button with your finger tip. 1. The unit has small parts. To prevent choking hazard, DO NOT use by children under 3 years. 2. DO NOT make too much twisting, or the coating lacquer will fall off and the light will short circuit. TWINKLE TWINKLE LITTLE STAR, LIKE A DIAMOND ON YOUR CHRISTMAS TREE TOP - Comes with 120 delicate mini LED bulbs (90 steady LED bulbs & 30 twinkle LED bulbs) for a starry show - Gold steady bulbs are kissed by sunshine while cool white twinkle ones shine like stars in the winter sky - Metallic silver copper wire can be wrapped around your Christmas trees topper and garlands, adding romantic & fairy ambience - Battery operated, light up your Christmas automatically with a timer at night. 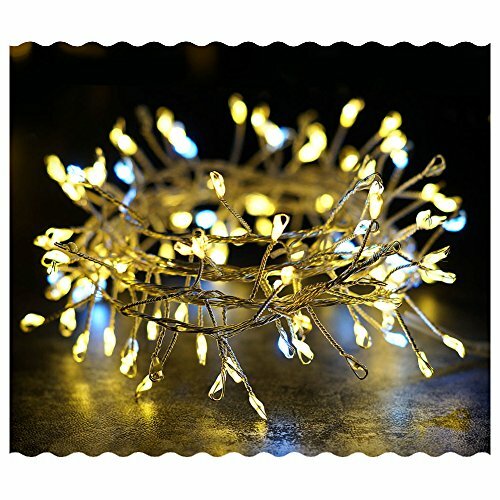 4.5' FT LONG STRING OF 120 STARRY MINI LED LIGHTS - 4.5' long vine string light makes indoor & outdoor possibilities endless - Bendable and flexible copper wire - DIY any shape you want as a centerpiece, or drop the string light inside translucent vases - Wrap it around tabletop Christmas trees, flower bouquets, bonsai, crafts or hang on bedroom window, bookshelf, makeup mirror, etc. - Effortlessly make any space stunningly special with these charming LED vine string lights. TIMER FEATURED & VERSATILE - Comes with a compact battery box (3 AA batteries included), not really noticeable and easy to decorate - A 6/18 hours timer allows to set the light for an automatic glow. Press button once to turn on at the same time every day for 6 hours then light up again after 18 hours automatically; Press twice to turn on constantly - The starbursts make the vine string light a charming decoration for any occasion indoors & outdoors - Ideal for Christmas, wedding, party, etc. DURABLE & ENERGY EFFICIENT - No wiring required, fast and easy to install - No more tangled mess of cords or searching for an outlet - Long lasting LED bulbs stay cool to touch after long-time use - Provide energy saving while enhancing your home atmosphere - The copper wire coated with insulated lacquer; LED bulbs are waterproof design - Wrapped around a cardboard tube, convenient for reuse and storage - Comes in a gift box, ready for gift giving to friends, relatives and loved ones. If you have any questions about this product by Bright Zeal, contact us by completing and submitting the form below. If you are looking for a specif part number, please include it with your message.